"The memory of that scene for me is like a frame of film forever frozen at that moment: the red carpet, the green lawn, the white house, the leaden sky. The new president and his first lady. - Richard M. Nixon"
and the words 'red', 'green' and 'white' will come from $color. 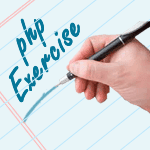 Previous: PHP Array Exercises Home. Next: $color = array('white', 'green', 'red'') Write a PHP script which will display the colors in the following way.